FILE - Salif Diallo, a former right-hand man of ousted president Blaise Compaore, was elected head of the national assembly on December 30, 2015. Burkina Faso's Salif Diallo was elected head of the national assembly, making the ally-turned-opponent of ousted leader Blaise Compaore the second most powerful man in the nation. Diallo was elected a day after Roch Marc Christian Kabore was sworn in as Burkina Faso's new president. Diallo was installed in his new position immediately. Diallo and Kabore founded the Movement of the People of Progress party in January 2014 after breaking ties with former President Compaore, who was ousted in a popular revolt in October 2014 in a move sparked by an attempt to extend his 27-year rule. Elected by 78 of the assembly's 127 members, Diallo made a speech to parliament Wednesday in which he called on lawmakers to act as advocates of the poor and working classes and fight against corruption and nepotism. He called for lawmakers to support job creation for youth, drinking water for farmers, and the economic freedom of women. On Tuesday, as Kabore took the oath of office, he promised to "preserve, respect, enforce and defend the constitution" in a ceremony from Ouagadougou broadcast live on Burkinabe radio and television. 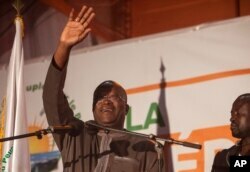 A transitional government organized last month's presidential election, which Kabore won with 53 percent of the vote. The vote was originally set for October but was delayed by a failed coup attempt by members of Burkina Faso's elite presidential guard.